As beleaguered parents all over the country endeavor to prod their kids to finish their requisite science fair projects, some may find it helpful to provide some inspiration from past winners of the Intel International Science and Engineering Fair. These are not your basic tabletop volcanoes or series of potted sunflowers. Many sport titles that you'd expect to see gracing the pages of the most prestigious scientific journals, and some of them actually have. Others became inventions developed for use in the wider world while their inventors were still in high school. Each and every one of these projects won their teenage researchers big prizes and hefty scholarships to ensure their future success. 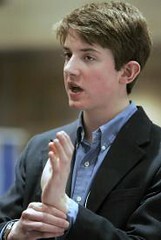 One of the ISEF 2001 winners invented something so completely cool that he bowled over the competition to win a total of more than $200,000 in cash prizes and scholarships. The idea came to then 17-year old Ryan Randall Patterson of Grand Junction, Colorado, over an order of burger and fries at a fast food restaurant. The customers were deaf and needed an interpretor to get their order right, so Ryan decided to develop a method to make it easier for the hearing impaired to communicate with regular people. It's a glove that translates American Sign Language into large, easy to read letters on a computer screen. This is a kid who carried around an electrical cord instead of a security blanket as a toddler, and requested extension cords from Santa. He helped his dad rewire an extension to their house when he was 6, and managed to live through a bad experiment once when he stuck a screwdriver into an outlet. Ouch! Doesn't seem to have hurt his brain much, though. Sometimes the most far-reaching discoveries come about by putting already available technologies to new uses. 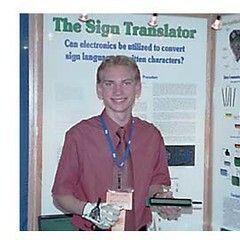 One big prizewinner in the 2005 ISEF fair in Phoenix did just that. 18-year old Ammem Abdulrasool, a senior at the Illinois Junior Academy of Science, developed over three years a way to allow the visually impaired to navigate themselves by using the Global Positioning System. Inspired by his love for his father, who is visually impaired, Ammem set out to find a way to help and ended up not just winning the big prizes at ISEF, but being named an official Science Hero. He describes his invention, said to be one of the biggest innovations for the blind since the invention of Braille, as "an 'On-Star' system at the handheld level for the blind." Abdulrasool planned to major in business administration at the University of Illinois, Urbana Champaign. We older folks rely on our kids to do many computer things for us these days, so it's not surprising that the ISEF fairs have a category for computer science. In 2003's fair 16-year old Elena Leah Glassman from Central Bucks High School West in Doylestown, Pennsylvania took top awards for developing an algorithm that allows people with muscular disabilities to use computers with the help of electro-encephalographic signals. The algorithm interprets signals from the brain when a person thinks about a task. For interpreting which keys on a keyboard these wavelets are signaling, Glassman achieved 90 percent accuracy using EEG wavelets she found in the public domain. When putting that to use with electrodes on her own scalp and interpreting the specific wavelets for particular keys, she managed over 70 percent accuracy. This informed her that in real life applications the software had to be customized to each user. Impressive! 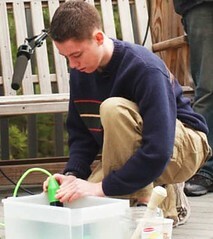 Michael Nyberg of Old Lyme, Connecticut took top awards in the 2001 ISEF fair with this experiment that explained why iron doesn't rust in super-oxygenated water. That might not sound too spectacular, except that the concept had specific applications that Michael and his father started a company to develop - controlling mosquitoes without the use of insecticides! They called it the "Larvasonic" and it works by introducing sonic waves into standing water to kill mosquito larvae before they mature and fly away to spread diseases and cause pesky bites. Even at low frequencies the waves rupture an air bladder just below the head of the larva. Because the frequency is so specific, it does not harm fish or other species living in the body of water. 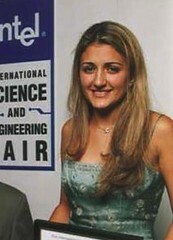 In the 2006 ISEF fair in Indianapolis, 16-year old Mahdavi Gavini blew everybody away when she managed to achieve a significant medical research breakthrough while searching for a way to help a friend who suffered from cystic fibrosis. She began the project when she was just 14, having found that most CF sufferers die of pseudomonas infections. These opportunistic pathogens form a thick, protective layer around themselves so that it's nearly impossible for antibiotics to penetrate. This student at the Mississippi Institute of Mathematics and Science turned to traditional Ayurvedic medicine to find a way to defeat these deadly bacteria. Eventually she isolated a specific molecule in a tropical plant extract that inhibited its growth by preventing the transcription of vital genes. Rather than patenting her discovery, she made the information readily available and plans to seek many more alternative cures in the future. 6. Determining Carbon Nanotubes' Thermodynamic Solubility: The Missing Link to a Practical Supermaterial? 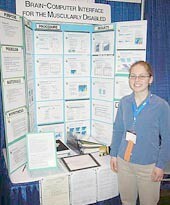 This big winner of $70,000 in prizes and scholarships at the 2007 ISEF fair in Albequerque was Sweet 16 at the time. Philip Streich spent his usual days tending animals on his family's farm near Platteville, Wisconsin, where he was home schooled by his parents. He had not at the time decided if he wanted a career in science, but had already racked up college credits, and was a member of the U.S. Physics Team. Oh... and MIT's Lincoln Laboratory named a minor planet after him, as they do for all first and second place category winners. Streich has a way of explaining his interest in nanotubes that communicates well why this material might capture the imagination of future scientists like your offspring. 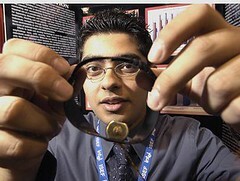 Just think of a nanotube as a long, thin pipe made of carbon atoms that have "super-properties." Possible applications? A bridge to the moon, a super-cool stealth fighter, or maybe just a very light and sturdy frame for a racing bike. 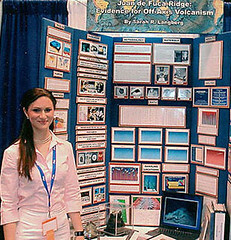 A student at the Canterbury School in Fort Myers, Florida, Sarah Rose Langberg won the big money prizes, some special awards and government prizes in the 2004 ISEF competition with research that put many masters' theses to shame. Sarah's hard work included chemical investigations, a mathematical simulation, and poring over video of the ocean floor to accurately characterize one of the earth's most active volcanic regions. She became a Merit-based Scholarship winner at her school as a freshman, went on to become Florida's National Honor Society vice president in her senior year, and was her class valedictorian. This is one high school student research project that really did make it into the scholarly scientific press - she presented her research at the National Society of Exploration Geophysicists Convention in Denver in 2004, and her paper was published in the journal The Leading Edge. Alexander C. Mittal, a 17-year old from Greenwich High School in Greenwich, Connecticut, took top honors in the 2002 ISEF fair with this head-spinning entry in the chemistry category. His project examined the use of peptide nucleic acid [PNA] in combination with DNA to create some unique double-crossover structures that could serve as scaffolding upon which to create molecular size electronic circuits. Mittal learned from cancer research that the artificial PNA molecule was extremely stable, and hypothesized that a dual DNA-PNA architecture could form a stable structure to be used in electronic arrays. So he designed and produced a totally new, stable PNA-DNA molecule to demonstrate his hypothesis. 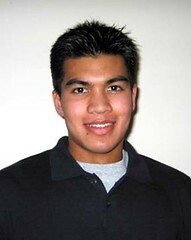 When he wasn't being a high school chemical engineering genius, Alexander was a Red Cross volunteer, captain of the school's cross country team and co-editor of the school newspaper. His dream? To be one of the first astronauts on Mars. Now, that's a mouthful! Nazanin Jouei of Ely High School in Pompano Beach, Florida was interested in the chemistry of sight, and developed her own theory to mathematically explain energy changes affecting the configuration of molecules related to our sense of sight. The chemical change she found in her experiment was subtle, but well documented. In case there is some confusion, a diene is a molecule with two double bonds. A conjugated deine is a hydrocarbon molecule with double bonds separated by a single bond. These form the most stable hydrocarbon molecules. Photoisomerization is when light excites the molecules and causes an structural change in the molecule even though its atoms remain the same. Jouei hypothesized that it was this conformational change in certain molecules in the retina of the eye that produce the sense of sight. In the category of mathematics, 17-year old Sana Raoof of Jericho High School in Jericho, New York produced this mind-bender to win the Intel Foundation Young Scientist Award and $50,000 scholarship in the 2008 fair in Atlanta. She chose Harvard, which no doubt feels privileged to have won the bidding for this brilliant young mathematician. Copyright © 2002-2009 ScienceFairProjects411.com, All Rights Reserved.